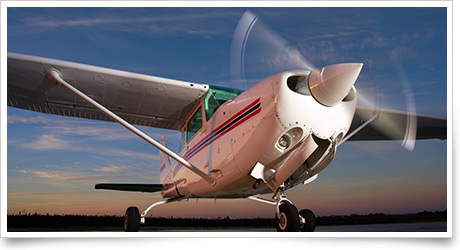 Your trainer's propeller develops thrust by accelerating air rearward, creating a flow once generally known as propwash that now, usually, goes by the term slipstream. Whatever word you've heard, the air involved in this flow has not finished exerting its varied influences on your aircraft's flight once it has interacted with the prop. From stalls to glides, or the cooling of the aircraft's engine, slipstream effects make their presence known in many ways during flight. A student pilot is most likely to first encounter the term slipstream in ground school, when studying the aerodynamics of slow flight. The so-called spiraling slipstream is one of the forces that create most single-engine airplanes’ left-turning tendency—an effect that is most pronounced during flight at minimum controllable airspeed. The rudder and elevators of many aircraft become "alive" early in the takeoff run because of slipstream effects—but not in T-tail aircraft on which the horizontal surfaces are positioned outside of the propeller slipstream. If a cabin door should pop open after you take off, the slipstream tends to keep it pressed close to the fuselage until you can land and close it again. When a pilot senses a change in aircraft noise after an airspeed adjustment, flap extension, or during a power-off glide, another slipstream effect is making itself known. This perception may occur at an unconscious level, contributing to a pilot's ability to "fly by feel." Slipstream air is harnessed to cool most trainers' engines, but traditional inlets "that extend into the slipstream to 'scoop' the air obviously create considerable parasite drag. NACA (National Advisory Committee for Aeronautics) researchers discovered that turning the scoop inside out so that it is recessed in the engine cowl or airplane structure resulted in a much smaller loss of efficiency," Mark Twombly wrote in the November 2003 Flight Training. Slipstream effects have a lot to do with the contrasting aircraft responses during two kinds of stalls. During power-on stalls, the elevators may stay effective longer if they are within the propeller’s slipstream. That, along with the effects of propeller thrust, explains in part why you may have noticed that power-on stalls may feel more abrupt than power-off stalls. For the pilot who wants a kneeboard with extras, APR’s lighted omni kneeboard comes with a light-emitting diode (LED) light that illuminates the board’s surface. The board is engineered of aluminum and includes one-inch top and bottom clips to hold flight plans, charts, or an approach plate book. The board is held in place by an adjustable elastic strap. Included in the $119.99 price is a pad of VFR en route flight logs. Order online or call 800/249-5730. Question: I know I am not allowed to use my cellphone while airborne on commercial flights; may I use it while airborne in my own private aircraft?